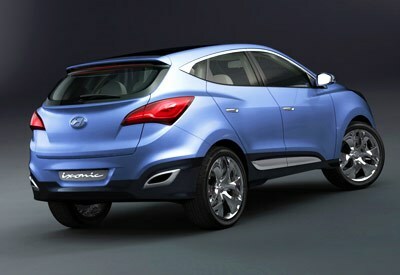 This is the next Tucson. Or is it a Mazda? Highlights: The odd moniker (pronounced ick sonic) is probably the least fluid aspect of this car, which at certain angles looks very similar to the Mazda CX-7. The sensational all-new Hyundai ix-onic concept car, which makes its world premiere at the 79th Salon International de L'Automobile in Geneva, introduces a whole new look for a compact 4x4 SUV. Assertive, but not aggressive, the ix-onic (pronounced "ik-sonnik") combines dynamic, sculpted, performance-oriented styling with an environmentally-friendly power train and thoughtful everyday utility, to create a vehicle that will change the way consumers and especially younger car buyers think about compact crossover vehicles. Hyundai's design team in Rüsselsheim, Germany views ix-onic as an 'urban nomad, a car of contrasts for a world of contrasts'. Created in Europe, with European consumers in mind, the new concept is inspired by multi-cultural personalities of cities like Berlin, Paris and London. The ix-onic is tough and compact for life in the city, but sleek and agile for out-of-town travel. The ix-onic's specially developed, high-contrast exterior paint emphasises its dynamic and flowing lines. Employing an advanced-effect pigment, the innovative paint gives the car's skin a brilliant shine. With an overall length of 4,400mm, the 1,850mm-wide and 1,650mm-high ix-onic has a great stance and road presence. The design team fused a light, elegant and sporty upper body, with belt lines flowing off both the front and rear wheel arches, to a tough, planted lower body so that the concept is assertive in the way it sits on the road. Key attributes of Hyundai's 'dynamic sculpture' design philosophy are the athleticism and sophistication that ix-onic demonstrates through its dynamic and flowing lines, full surfaces and muscular presence. This athletic design language is highlighted by bold, dynamic graphic elements such as the hexagonal front grille, the dramatically swept back headlamps, the split belt-line and the third side window kick-up. The hexagonal grille is a further evolution of the style introduced on the 2006 Genus concept car and developed for its appearance on the i-mode concept in 2008. The headlamps feature innovative LED daytime running lights (DRL) which are becoming an increasingly important element of brand identity. For the innovative ix-onic, part of the DRL moves down whenever 'dipped beam' is switched on, and DRL are also fitted to the door mirror housings. The profile of ix-onic features a dynamic greenhouse and a sports car-like theme with a muscular, double-zigzag treatment for the wheel arches that wrap around the 21-inch polished alloy wheels. Unusually, the concave sills have a wedge-shaped profile which extends rearwards and wraps around into the rear bumper. The sills and bumper are finished in a contrasting colour, with an aluminium garnish that echoes the aluminium trim in the door handles to enhance the perception of premium quality. With high-mounted tail lamps, multi-surfaced glass and a sculpted bumper, the rear of ix-onic also incorporates 'dynamic design' elements. The rear lamp clusters feature a grille mesh inspired by the nature, while the rear bumper also neatly incorporates the dual, polished aluminium exhaust tailpipes. The rear window has been designed and produced by Hyundai in close cooperation with the QarmaQ-partner SABIC Innovative Plastics. Using Lexan high-performance plastics instead of conventional glass enabled the designers to give the rear window a much more three-dimensional shape. On each side of the rear window, two vertical spoilers are integrated to reduce aerodynamic drag. The upper part of the window features a strongly concave shape to make it possible to integrate the roof spoiler in the rear window. Additionally, "Exatec- glazing" was used to incorporate the third stoplight in the upper part of the rear window. Furthermore, a three-dimensional U-shape surrounds the rear wiper to enhance its visual integration into the backlight. Inside, the five-seater ix-onic offers a commanding view of the road and evokes an adventurous ambience that is also laid-back and relaxing. The needs of the driver are fully accommodated, with the interior blending aspects of the outdoors, leisure time and an urban lifestyle. The first impression of a sporty, light and fresh interior is reinforced on closer inspection by the silky cream-white leather that brings an air of elegance and distinction to the cabin. An X-shaped visual theme is repeated across numerous areas of the cabin, with embossed leather to accentuate key areas while light-alloy magnesium accents provide flashes of visual brilliance. The sleek shapes of the interior are outlined with 'ice blue' seams that replicate the colour of both the ribbed ice blue floor carpet, which contains a high percentage of natural cashmere wool, and the exterior. Shapely seats feature centre panels trimmed in breathable fabric with attractive and functional cushion side bolsters, plus additional lateral support for occupants' shoulders - all trimmed in contrasting magnesium grey. Mounted much higher than usual in the doors, the audio speakers present occupants with a true and highly detailed, top-quality sound reproduction. The interior rear-view mirror has a 'blind spot' warning light that alerts the driver to other road users in close proximity. Beneath its sensational exterior, the ix-onic's power train is equipped with a 170 PS, 1.6-litre GDi turbocharged, four-cylinder petrol engine, with ISG (Idle Stop & Go) technology and a double-clutch six-speed transmission. Power is transferred to the road by an intelligent four-wheel-drive system fine-tuned to deliver outstanding on-road driving dynamics, together with significant off-road ability. The next-generation, eco-friendly engine emits just 149 g/km of CO2, an impressive figure for an SUV.